from "The Little Colonel at Boarding School," "The Little Colonel's Christmas Vacation"
and "The Little Colonel's Knight Comes Riding"
at The Filson Historical Society, Louisville, Ky., 996PC26.21. Dau. of Rev. and Mrs. Hosea Howard, born in Burma, India, Mother of Howard Fales Cleland and Mary T. Cleland, Pewee Valley, Ky."
Well, I pity you!" exclaimed Rob, teasingly, tapping his racket against the toes of his tennis shoes. "Boarding-schools are a bad lot, all that I've ever heard of. Scorched oatmeal and dried apples, with old cats watching at every keyhole! Ugh!" Both girls laughed at his scowl of disgust, and Betty hastened to say, "But we'll have Aunt Cindy to fall back on if the fare gets too bad. That's the beauty of staying so near home. Mom Beck is to come every Monday to get our clothes to launder, and every Saturday to bring them back and see that we are all right, and you know she'll not let us starve. And there aren't any old cats in this school, Rob. Miss Edith is a dear. The girls fairly love the ground she walks on, and I'm sure that nobody could be nicer and more motherly than Mrs. Clelling." Allison's plan, as she outlined it to Betty, Lloyd , and Kitty at recess, in one of the swings, was to form a club that should be not only fun for themselves, but of some real benefit to the girls of the mountain districts. The Christmas before, the little circle of Busy Bees, to which Elise belonged, had sent two barrels of clothes and toys to them, under Mrs. Clelling's supervision. Based on these two clues, we believe the real-life model for Mrs. Clelling was Mrs. T. H. Cleland, widow of Pewee Valley Presbyterian Church minister Dr. Thomas Horace Cleland and a music teacher at the Kentucky College for Young Ladies ("Lloydsboro Seminary"). 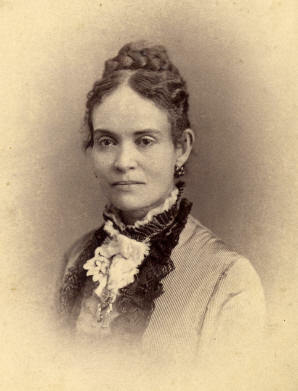 MRS. LOUISE T. CLELAND was a pupil of the National School of Music, Philadelphia, and also of the Conservatory of New York. Her successful work in some of the largest schools of the South, and her very marked success in Kentucky College for the past few years, stamp her as a teacher of unusual attainments, and of wonderful ability. 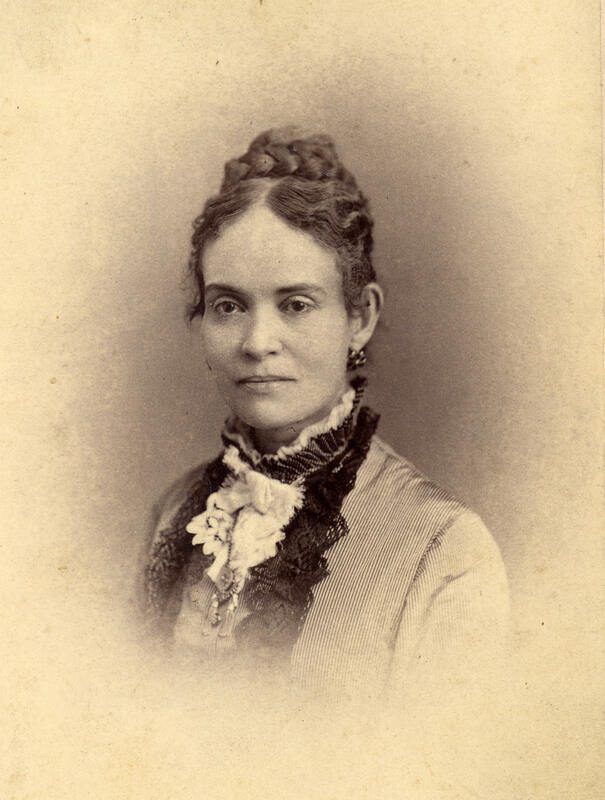 That she had only been teaching at the college “for the past few years” can likely be attributed to her husband’s death in 1892. She may have needed to go to work, since the Cleland family didn’t own a home in Pewee Valley. During her husband’s seven-year tenure as pastor, they were provided with free housing at the manse next to the church. 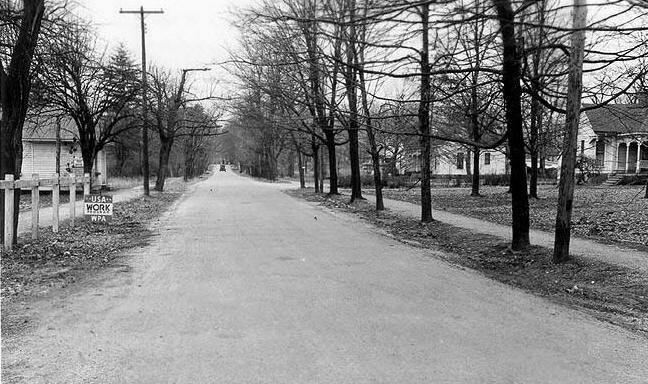 Mamie Cleland on Ash Avenue, near Clovercroft and the "Lloydsboro Seminary"
We also know that Mrs. Cleland and her daughter, Mary, were active members of the church until they died. “The United Presbyterian Church in Pewee Valley 1866-1966 100th Anniversary" booklet notes that Mrs. Cleland taught the Primary Class of the Sunday School for 42 years and served as president of the women’s group. She may have also worked with the Busy Bees, the name of the church’s young women’s group until 1888. Pewee Valley Historian Virginia Herdt Chaudoin recalls that Mrs. Cleland had a cane and, while teaching Sunday school, would use it to redirect her pupils’ wandering attention by hooking their necks. Affectionately known to the congregation as “Miss Mamie,” Mary was singled out in the anniversary booklet for her many contributions to the little congregation, including helping the church secure a new manse at 304 Maple Avenue. It also appears she continued at least one of the charitable traditions started by her mother. Gin Chaudoin recalls that Mary owned a shipping trunk she used to send donated clothing to the mountains. … the Bisbee place …was a white frame house standing near the road, and commanding a view of both station and store, as well as the approach to the post-office. To her surprise, some one tapped on the pane of an up-stairs window. Then the sash flew up, and Mrs. Bisbee called in her thin, fluttering voice: "Lloyd! Lloyd Sherman! If you're going to the post-office, I wish you'd ask if there is anything for me. I don't dare set foot out-of-doors this cold weather." Then, fearful of draughts, she banged the window down without waiting for a reply. Lloyd smiled and nodded, glad of an opportunity to be of service. As she hurried on, she remembered that Miss Allison had spoken of this gentle little old lady, with her fluttering voice and placid smile, as one of the most interesting and "Cranfordy" characters in the Valley, and that, while she never went out in the winter, and seldom in the summer, except to church, she kept such a sharp eye on the neighbourhood happenings from the watch-tower of her window that Mrs. Walton laughingly called it the "Window in Thrums." It was with the feeling that she was stepping into a story that Lloyd opened the gate five minutes later and started up the path. A vigorous tapping on the window above, and a beckoning hand motioned her to come up-stairs. Hesitating an instant on the porch, she opened the front door and stepped into the hall. "Do come up!" called the old lady, plaintively, from the head of the stairs. "I've been wishing so hard for company that I believe my wishing must have drawn you. Now that daughter is married and gone, I get so lonesome, with Mr. Bisbee in town all day, that I often find myself talking to myself just for the sake of sociability. Not a soul has been in for the last two days, and usually I have callers from morning till night. This is such a good dropping-in place, you know. So central that I see and hear everything." While Annie Fellows Johnston depicts the fictional Mrs. Bisbee as lonely because her daughter had married and moved away and her husband worked in Louisville, in reality Mrs. Cleland would have been alone much of the time because she was a widow (she lived about 30 years after her husband died) and her unmarried daughter, Mary, worked in downtown Louisville for the L&N Railroad. At present, we are not certain where Mrs. Cleland lived after her husband died and the Rev. James Curry Randolph became the church’s new minister. 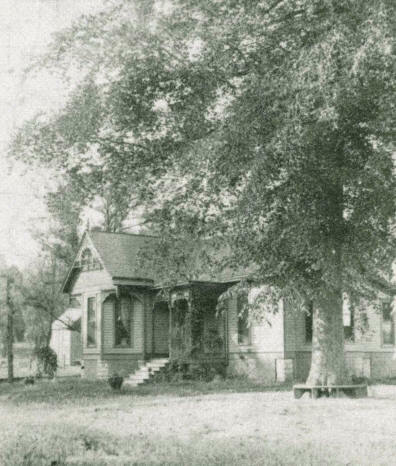 We believe she may have lived in this small home on Central Avenue located behind what is now the Little Colonel Playhouse, but would have been Jurey & Harbourt’s store in the 1890s. When it burned, we felt like we were saying goodbye to Louise Cleland and "Mrs. Bisbee." Though not two-story, the house is similar to Annie Fellows Johnston’s description in several respects: it is frame, situated close to the road (as compared to other homes in the Pewee Valley), has a big window bay, is located directly across from the site where the post office stood, and would have had a view of the H. M. Woodruff/Foley Brothers store on the opposite side of the street. The Pewee Valley Presbyterian Church belfry would also be visible from the window bay-- the "Window in Thrums" in the stories. . Unfortunately, the 1900 U.S. Census* does not provide addresses; however, it does show a Louise T. Clelland (note spelling inconsistency), widowed music teacher, living with her unmarried daughter Mamie in dwelling no. 5 in the area along what is now Hwy. 146. Neighbors included the Muirs at Oaklea (dwelling no. 2); the John and Lottie Gibson family in dwelling no. 3; the Fible family in dwelling no. 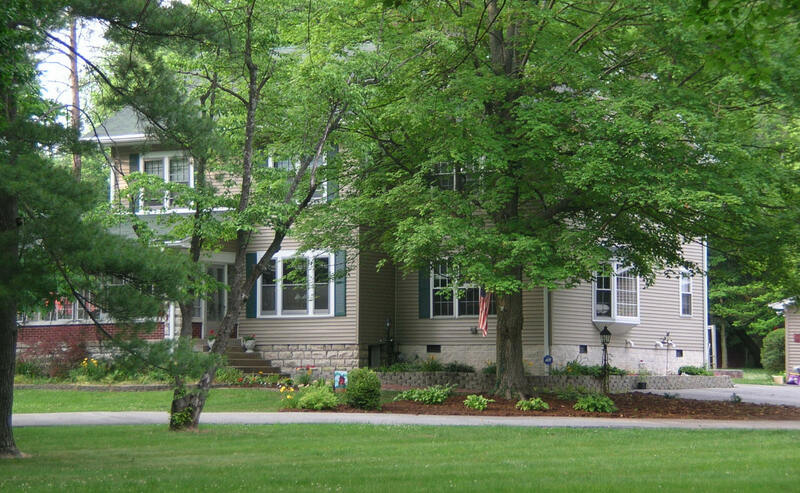 4; the Matthews family at Clovercroft across the street (dwelling no. 6); and the Burges in dwelling no. 7 west of the Foley Brothers’ store. and the post office on the left. On the right is the house we believe Louise Cleland lived in after her husband died. By 1915, we know Mrs. Cleland was living at 117 Ashwood Avenue in a large, two-story craftsman-style home built by her daughter, Mary. (See “Historic Pewee Valley,” page 28.) Anne Montgomery in her 1994 tour book, “35 Landmark Homes of Pewee Valley, refers to Mary Cleland’s home as Holly House, so named because there were over 100 holly trees on the property. The lot the house stands on was once owned by the Kentucky College for Young Ladies. Mary Cleland had a friend purchase the land for her from the L&N for $350, Montgomery writes, and built the house for $4,000. By the 1930 U.S. Census, Louise Cleland is missing and presumed dead, and Mary T. is listed as a railway office agent living on Ashwood Avene with her brother Howard F., also a railway office agent, her (step) sister Rose (Cleland) Grundy, age 82, and her brother-in-law, John Grundy, age 84. According to Gin Chadouin, the Grundys had a room on the home’s third floor and John was blind. After years of traveling great distances to Harrodsburg or New Providence churches, Isaac Gray, Josiah Wilson, and Abram Whitenack determined to build church in their Mt. Pleasant community. Completed 1851; organized 1852 with 58 former members of New Providence Presby. Church. Rev. Thomas Cleland preached the organizational sermon. (Reverse) Mt. Pleasant Church - Church housed Mt. Pleasant School, 1858 until one built on the site south of church in 1860s. Slaves attended church here before Civil War; buried in unmarked graves. Church illustrates denominational variety of two-door architecture in antebellum Bluegrass. Segregated seating, men on left and women and children on right, was observed. Presented by Mt. Pleasant Church. After his father’s death on January 1, 1858, Rev. T. H. Cleland, along with Edward Porter Humphrey, helped compile his father’s memoirs. The resulting book, “Memoirs of the Rev. Thomas Cleland, D.D. compiled from his private papers,” was published in 1859 by Moore, Wilstach, Keys & Co. in Cincinnati. Rev. Cleland also published a 48-page Gospel Book called, “The glory of the celestial and of the terrestrial, or, The dispensational difference between the church and the kingdom of Heaven,” which was published by the Gospel Book and Tract Depository in St. Louis. 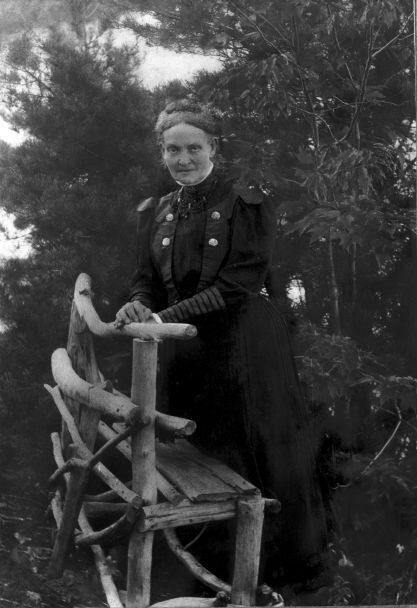 Louise Howard Cleland was born in India in January 1846 and was actually younger than most of her step-children. Her parents were missionaries from England and Rev. Hosea Howard, which we presume was her father, brought a laptop writing desk with him to America when they came here. Louise and Rev. T.H. Cleland had two children: Howard F., born in 1867, and Mary T., born March 1873. Howard’s middle name, Fales, derives from an uncle, Dr. J.C. Fales, who married one of T.H. Cleland’s sisters and taught at Home College. Louise died around 1927 (based on the history of the Pewee Valley Presbyterian Church) and Mary died around 1954 (based on her will). Both are buried at Ryder Cemetery in Lebanon, Kentucky. The Filson Historical Society in Louisville, Ky. has an extensive collection of Cleland family portraits, as well as the necktie Rev. Cleland wore at his wedding to Louise Howard. used her as the model for Mrs. Clelling and Mrs. Bisbee in the "Little Colonel" stories. 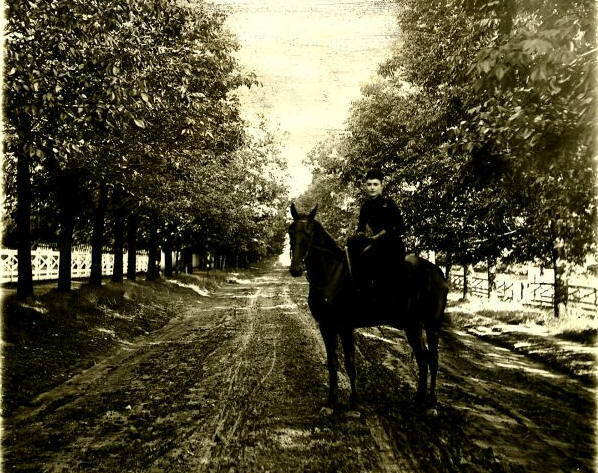 Photo from the University of Louisville Photographic Archives Kate Matthews Collection.